He seems shy at first. But when he gets onstage to dance, Mckenzie Bernardino is poised and confident — like a graceful bird taking flight. 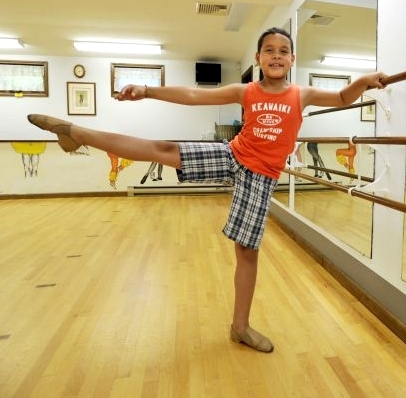 The 9-year-old Danbury [Connecticut] boy has won numerous competitions since he first started lessons at the Academy of Dance Arts in Brookfield. In 2009 he was chosen from more than 400 children to attend the School of American Ballet at Lincoln Center in New York, where he has been studying on a full scholarship. Afterward, they had to wait three months for the school’s decision. Finally a letter arrived, and everything fell into place. Mckenzie started dancing when he was 4. “He used to imitate a TV cartoon called `Angelina Ballerina,’ ” said his mother. Angelina is a dancing rabbit. Mckenzie learned basic ballet positions and moves by watching her. Though she and people such as her husband, Robson Furtado, as well as her brother and pastor were — and are — supportive, some others still gave him a hard time. They told him to pursue other interests. He tried karate, but didn’t like it. With Mckenzie excelling locally and at the School of American Ballet, no one is poking fun now. After performing as a soloist, he was chosen to compete in Chicago, where he worked with a Disney choreographer and also danced in the opening number of an international competition. Last year, when Mckenzie was in third grade at Danbury’s King Street Elementary School, Bernardino drove him to Manhattan four times a week for classes. This year he’ll go five times a week. Bernardino acknowledged she could not support her son’s efforts if it were not for the assistance and encouragement she receives from friends, family and fellow congregants at Emannuel Church on Main Street in Danbury. Though she earned a law degree in Brazil, she works cleaning houses now, and has limited resources. When Bernardino first came to the United States, she lent a hand to others, as well. She started sending money back to Brazil so her sister and two nieces could go to school, and still does what she can to help. “I thought I could live here and build a better future for me and my family,” said Bernardino, who taught herself English by watching cartoons and listening to music. She said she could not help Mckenzie with his dream if it were not for his ballet scholarship, the Brookfield school’s flexible payment schedule, and the wages she earns from her clients. Mckenzie still studies at the Academy of Dance Arts in Brookfield, where director Doreen Rafferty described him as “amazingly talented.””He has a fantastic memory and is always prepared — all the things we want,” she said, adding the school has a few hundred girls, and about eight boys. Aside from taking classes in ballet, tap and jazz, where Mckenzie said he feels “comfortable,” he’s a typical kid. He likes music by artists such as Katy Perry and Nicki Minaj. And after school he plays tag and catch with neighbors and cousins. The thing is, his mom never has to call him and say it’s time for dance class. He knows and is ready to go. “You have to believe in yourself and never give up,” Mckenzie said. © 2012 Hearst Communications Inc.